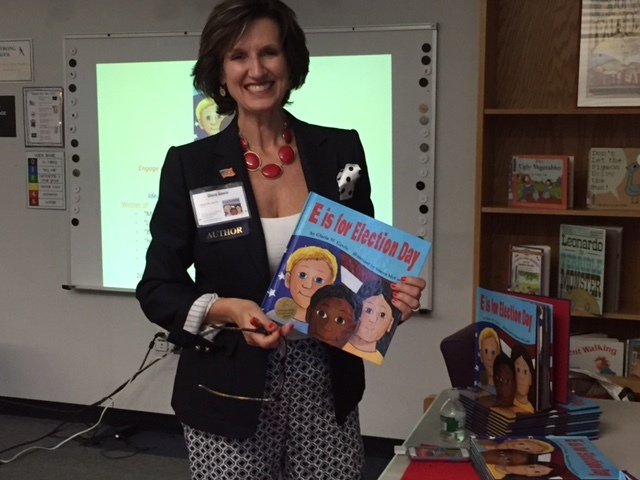 On October 5, 2016 Nobscot Reading Council hosted “E is for Election Day” featuring author Gloria Gavris at the Armstrong Elementary School in Westborough. E is for Election Day, a fun and engaging A-to-Z tour of the American electoral process, introduces contemporary aspects of the election season in an informative and child-friendly way. Raised in a politically active family, Ms. Gavris also shared personal memories of elections during her childhood and adolescence. Her presentation, very relevant during this presidential election year, showed that everyone has the power to make a real difference in their government. Attendees had the opportunity to purchase signed copies of Ms. Gavris’ book at the end of the program. 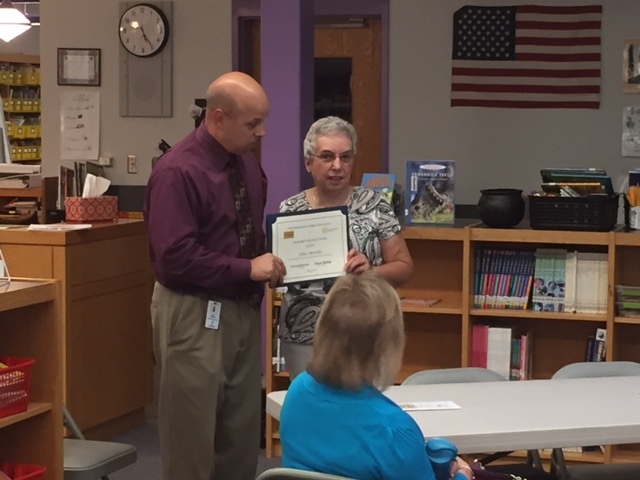 After Ms. Gavris presentation John Mendes, principal of Armstrong Elementary School in Westborough, was presented with the Nobscot Reading Council’s 2016 Celebrate Literacy Award. John is an inspirational school leader who has a way of motivating teachers and students alike to work hard and achieve goals. He utilizes a school model of education where “all” includes school staff, students, parents, and community. When it concerns literacy, he has a shared vision of success for each student, has created a positive school environment, promotes leadership opportunities for others, believes in the importance of using data to inform instruction, and has worked with the staff to improve literacy instruction at Armstrong Elementary School. He is an exemplary “literacy principal” who is most worthy of the Celebrate Literacy award. John Mendes is shown receiving the Celebrate Literacy Award from Terrie Marr, a member of the NRC Board of Directors.